We are passionate about providing great services that will help you achieve better heath. One of the largest primary-contact health care professions in North America, chiropractic is a non-invasive, hands-on health care discipline that focuses on the neuro-musculo-skeletal system. Chiropractors practice a manual approach, providing diagnosis; treatment and preventive care for disorders related to the spine, pelvis, nervous system and joints. For many conditions, such as neck and lower back pain, chiropractic care is frequently the primary method of treatment. Where other conditions exist, chiropractic care may complement or support medical treatment by relieving the neuro-musculo-skeletal aspects associated with the condition. Foot Levelers is the global leader in postural support products to help alleviate pain for millions of people. Their Custom Made Orthotics are clinically proven by 37 research studies to help reduce pain and improve patient wellness. 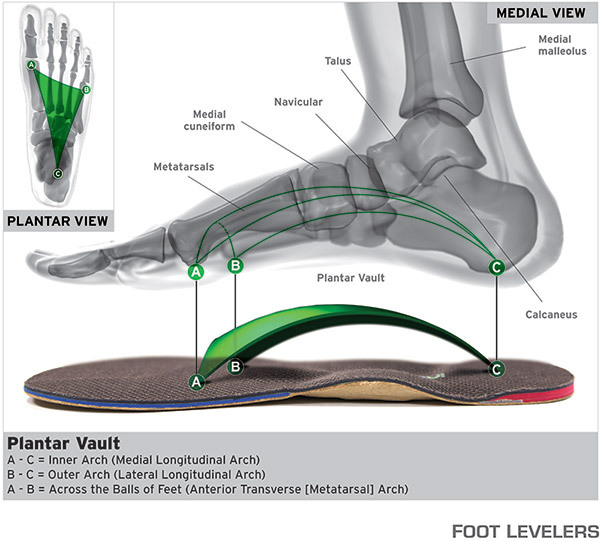 Unlike generic, over-the-counter orthotics, Foot Levelers Stabilizing Orthotics are individually designed for your unique postural problems — not just problems with your feet. They can improve your overall health by supporting your foundation. The feet are the foundation of the body. They support you when you stand, walk, or run. Feet also help protect your spine, bones, and soft tissues from stress as you move. By stabilizing and balancing your feet, Foot Levelers orthotics enhances your body’s performance and efficiency, reduces pain, and contributes to your total body wellness. Our orthotics complement your healthcare professional’s treatment when you stand, walk, and live your life in balance. Massage Therapy aims to relax, re-align and re-educate the body’s soft tissue. It can help to calm over stimulated nerves and over worked muscles. It can be used in partnership with chiropractic care, physiotherapy or/and regular exercise to help maintain optimal body function. Almost everyone can benefit from Massage Therapy including athletes, elderly, young, pregnant and sedentary people. *Please note that people undergoing treatment for active cancer of any kind are, unfortunately, contraindicated for massage therapy without WRITTEN permission from their treating oncologist. Come well hydrated to bring your blood volume up. Massage therapy tends to dehydrate people and your muscles will need blood to heal from the changes we make during massage treatment. Try not to take painkillers before you come. Painkillers inhibit your body’s ability to feel. You need to feel what we’re doing. Be prepared to talk. We need to know what history your body has in order to treat you effectively. Make up smudges. If you like to wear eye make up expect to have to touch it up or remove it before you re-emerge into the world. Cascadia Chiropractic Centre is proud to be on the medical technological forefront by offering MLS Laser Therapy. We have invested in the very best technology as a key component of our continuing quest to offer you the finest in health care. Laser therapy has been cleared by the FDA and proven successful as evidenced by extensive and credible studies conducted in our country’s finest institutions, including Harvard University. MLS Laser Therapy uses specific wavelengths of light that have a strong anti-inflammatory, anti-edema effect on tissues that are exposed to the laser. Painful conditions accompanied by swelling or inflammation benefit from this technology. Photons of laser energy deeply penetrate up to 5 cm into damaged tissues and accelerate cellular reproduction and growth. As a result of exposure to the MLS Laser, the cells of tendons, ligaments and muscles repair themselves faster. As inflammation is reduced, pain subsides very quickly. In simple terms, laser energy kick-starts the healing process, thereby speeding recovery. MLS: the Multiwave Locked System, a class IV patented emission system that synchronizes continuous and pulsed emissions providing well-aimed procedures that generate simultaneous anti-inflammatory and analgesic effects, and in considerably reduced times with respect to traditional laser therapy. MLS Laser Therapy products are helping medical professionals treat patients who present with debilitating acute or chronic pain. This painless and non-invasive modality alleviates pain and inflammation while accelerating the healing process. What are the Most Common Indications? MLS Laser Therapy is a painless treatment that lasts a few minutes. Some patients stated they feel a comfortable warm sensation in the area being treated, while other patients usually don’t feel the laser. There is no pain, heat, or swelling during or after the treatment. Positive results can often been seen after 1 to 3 treatments. Most conditions have protocols that range from 6-10 treatments. Any swelling is greatly reduced and there is a rapid relief of pain. The treatment effects are cumulative; therefore, expect to see improvements as you proceed through your treatment plan. What Wavelengths are used in MLS Laser Therapy? Why are 2 wavelengths used? MLS Laser Therapy uses two wavelengths to overcome the limits of traditional Laser Therapy. Traditional Laser therapy does not deliver both wavelengths in a reinforcing and synchronized fashion. Continuous laser emissions act fast on inflammation, stimulating blood and lymphatic circulation and inducing fast re-absorption of fluid build ups; however they only have a secondary effect on pain, which is diminished after reducing the inflammatory process. Pulsed laser emissions, on the other hand, have a practically immediate effect on pain, since they are able to induce analgesia, interfering with the very transmission of the pain impulse to the higher brain centers, but they are less effective at treating inflammation and edema. What is the Advantages of MLS Laser Therapy over traditional low level lasers (LLLT)? MLS Laser Therapy has been developed and tested for nearly 3 decades, following a strict course of biomedical and clinical research by world-class research organizations for treating traumatic and degenerative painful diseases. The departments of Biology at the University of Turin (Italy) and the University of Padova (Brazil), as well as the Department of Anatomy and the Orthopedic Clinic at the University of Padova, and Harvard Medical School (USA) have studied and verified the remarkable effectiveness of MLS Laser Therapy. An Effective Non-surgical option for chronic neck and back pain. What is KDT Spinal Decompression? KDT Spinal Decompression Therapy uses simple, yet sophisticated equipment manufactured by Mir-com Products, LLC. 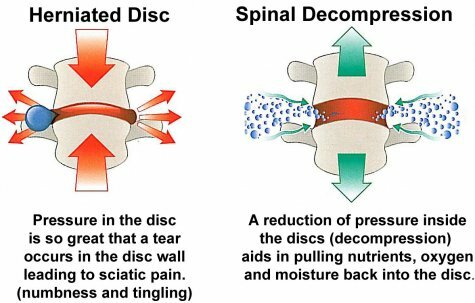 KDT Spinal Decompression slowly lengthens and decompresses the spine, taking damaging pressure off the discs. This reversal of pressure creates an intradiscal vacuum that helps to re-position bulging discs and pull extruded disc material back into place, taking pressure off pinched nerves. Spinal experts believe that nutrients, oxygen, and fluids are drawn into the disc to create a revitalized environment conducive to healing. The treatment process is safe and relaxing. 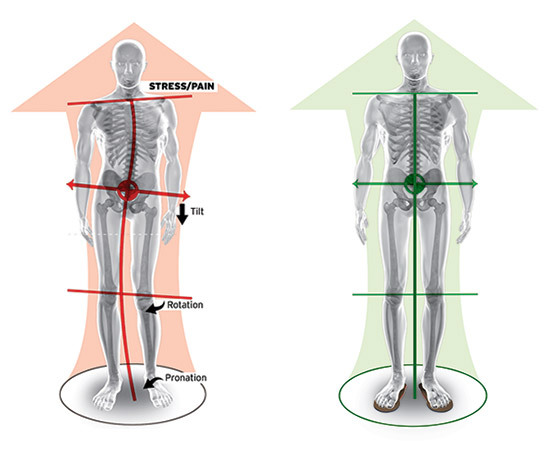 While some patients with extensively injured discs have reported mild discomfort during the first few treatment sessions, their discomfort subsides upon subsequent visits as the discs are relieved of pressure. Treatment sessions typically last less than 20 minutes and most patients feel pain relief with as few as 6-10 treatments. It is important to remember however, that pain subsiding does not infer that your discs and spine are healed, so it’s critical that patients stick with the treatment protocol prescribed by their practitioners in order to achieve the full value of KDT Spinal Decompression Therapy. Can I just hang upside-down? KDT Spinal Decompression Therapy is not to be confused with linear traction. Such devices like inversion tables and older, less sophisticated traction devices do not take the patient’s muscles into account. 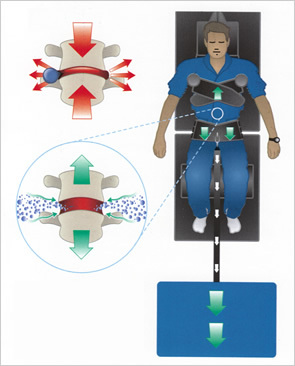 Normally, pulls exerted on the spine trigger sensory receptors in the back to tighten the muscles surrounding the vertebrae and discs in an effort to protect them from injury – a process known as the “muscle guarding reflex”.KDT Therapy bypasses this response by using automated computer assisted sessions that cycle the patient through a series of gentle pulls, holds and releases over an extended period of time. This allows the spine to be re-positioned without tension and without setting off muscle tightening effects from the “muscle guarding”. KDT Spinal decompression Therapy has saved many people from spinal surgery. If you are suffering from a degenerated disc or herniated disc, don’t risk surgery until you have explored safe and effective spinal decompression. KDT Therapy is a pain-free alternative that has shown a very high rate of success at reducing or even eliminating back and neck pain. 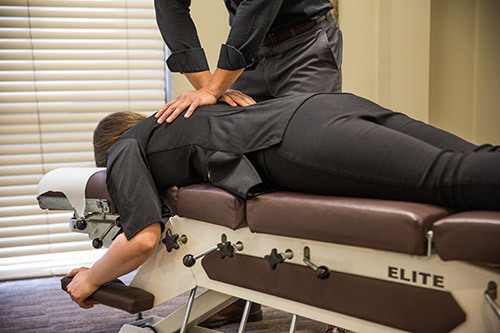 If you suffer from chronic, debilitating, low back or neck pain, you owe it to yourself to call our office today to make an appointment to see if you’re a candidate for KDT Spinal Decompression Therapy. The basic science is analogous to lithotripsy, the technology that high-energy sound waves (shockwaves) to break up kidney stones without surgery. The technique of using shockwaves to break up kidney stones has been around for a nearly a quarter century now, and doctors are using this technology to treat other painful areas of the body. This modern and highly effective treatment method introduces the high-energy sound waves into the painful areas of the body. With this innovative therapy approach, shockwave therapy accelerates the healing process in the body by stimulating the metabolism and enhancing blood circulation to regenerate damaged tissue. The beneficial effects of shock wave therapy are often experienced after only 2 or 3 treatments. The therapy eliminates pain and restores full mobility, thus improving your quality of life. What is a surface EMG (sEMG)? sEMG is a medical diagnostic technique in which electrodes are placed on (not into) the skin overlying a muscle to detect the electrical activity of the muscle. The electrical activity will help us gain insight into how tight or spastic muscles are on either side of the spine. Specifically in this office, the sEMG is placed over the muscles of the back in order to measure its balance from side to side. The muscles on either side of your spine should be balanced, much like a equal game of tug-of-war: if they are not working equally well, the body is forced to compensate, which takes energy. This imbalance can be monitored by sEMG technology. Having information about how a muscles have compensated or adjusted to an injury or biomechanical imbalance is extremely beneficial in patient diagnosis, treatment and management. At Cascadia Chiropractic Centre, our high-frequency machine is the latest in digital technology which enables lower radiation levels for convenient and accurate assessments. 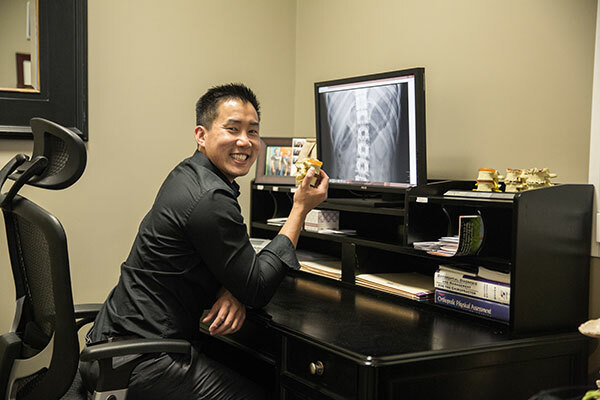 Your x-rays will be completely explained to you from a “patient’s point of view” at your Review of Findings appointment.